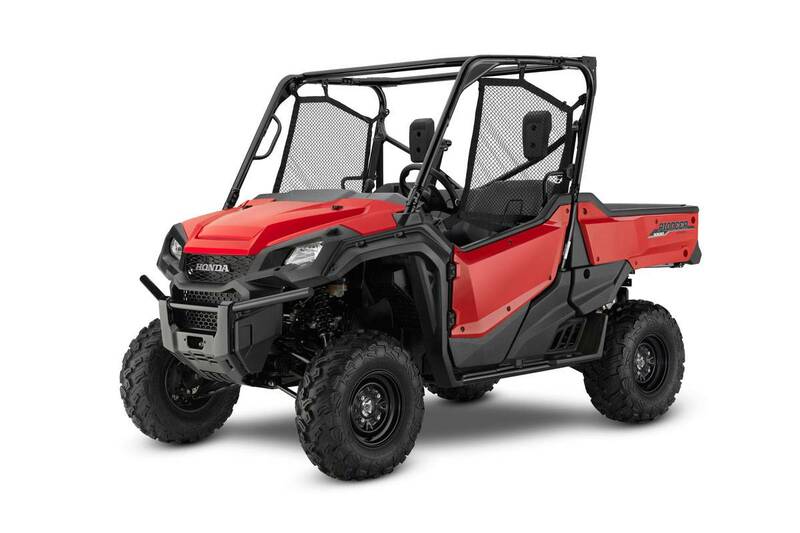 From stem to stern, the Honda Pioneer 1000 puts everything we’ve learned designing off-road bikes, ATVs, Side-by-Sides and autos into one package. The independent, long-travel suspension, excellent ground clearance and large tires all work in concert to deliver superior ride comfort and superb traction. The rubber-mounted engine and exhaust system insulates you from annoying vibration, so your driving experience is like riding in first class, not economy. With features you need, the reliability everyone wants, and the build quality that always puts Honda out in front. The Occupant Protection Structure uses sturdy, large-diameter tubing, and includes integrated handholds, recessed top tubes and a more spacious structure to enhance protection; it also meets OSHA’s 1928.53 rollover protective structure standard. Hard doors and roll-up side nets provide a secure feel and keep mud and debris out of the cabin, while automotive-style three-point belts with an Emergency Locking Retractor mechanism help keep everyone secure. Fully-Automatic Dual Clutch Transmission (DCT)with six forward gears and Reverse. Four drive modes include 2WD, 4WD, Turf and Differential lock.